How did you initially come to meet Fairnie? I was introduced to him at church, by the vicar… Charlie and Dot knew the Fairnies from their time living in London in the early 80s, Arts Centre Group and all that lot. I was always bemused by Fairnie’s compulsion about the importance of going to church – a kind of counter-anarchy. What role did he play during those mad years? Was his input/advice more on the business or on the creative side of things? Business? Not Fairnie’s strong area… Creative – as an encourager – was always encouraging (even though he must have hated some of the music). His best advice was to enjoy the process – and helped us do that. 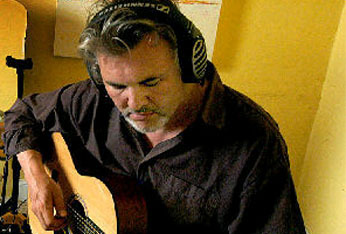 Although what LDL are all about on stage and on record is light-years away from what Fairnie & Sage were up to, what did you learn from their approach to performing and recording? That we were too buttoned up and predictable. A trip to Sweden as the Technos’ backing band was an eye-opener – a lesson in ‘being’ over and above ‘doing’. We were all uptight about rehearsing and doing things efficiently – the Fairnies were too busy having a very good time to think about that stuff. Afterwards, none of us could really describe or remember what it was that Fairnie actually did onstage, although we knew he’d done it very well – That made us think. I seem to recollect you relocated to Bristol around about that time. I went there to theological college, and Charlie and Dot came down from London a couple of years later. Where were your haunts at the time? Any magical memories of evenings spent with Fairnie and/or Sage? Quite soon after I met them, I called round one Sunday evening (they were still up in Westbury Park), and they sat me down in the middle of the lounge/diner and played me the entire original version of Gavin Bryars’ Jesus’ Blood Never Failed Me Yet – all 22 minutes, I think. Naturally I was speechless and amazed, and loved it – I used it in group work for years afterwards. I heard it on Radio 3 just the other day. A fairly regular treat was to be granted an audience at The Portcullis in Clifton – a wee, shabby place with low ceilings and no pretentions. I was always aghast at Fairnie’s ability to pour Guinness down his throat without any of the normal swallowing reflexes. So, although he’d buy the first round, he was ready for his second round before he’d got back to his seat. He was always keen to hear any ‘goss’, and was an enthusiastic absorber of any titbit that he considered ‘interesting’ (which was most things, I suppose). I remember his unabashed glee one night at receiving his first regular wage packet from the local art college – he couldn’t believe they were actually giving him good money to talk to students about being creative. I only remember positive and encouraging. I think Fairnie was someone who rigorously avoided conflict, but I consider that more of a strength than a limitation. 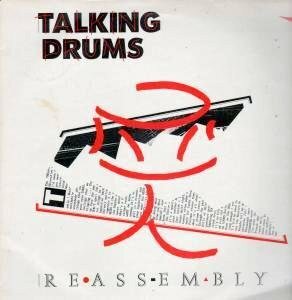 Although it might just be my mind playing tricks, I believe Fairnie designed a Talking Drums record sleeve, and of course his artwork was used for your compilation a few years back (pictured further up the page). I know this sounds like something out of a Fine Art GCSE exam, but how would you describe the Fairnie artwork you used, and what qualities made it fit your music? 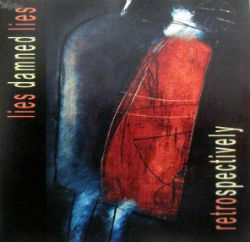 Actually we’ve just decided to issue that album ‘Reassembly’ on CD for the first time. He did the design for the album and the single with some other bloke. It was very graphicy and a bit downbeat – which I think we weren’t sure of at the time (we imagined more glamour), but I think they got it right – and was part of the reason Radio One took the single so seriously – I think I’m right in saying that it was playlisted for 4/5 weeks, while we tried desperately (and failed) to get it into the shops. Finally, more a question about LDL than Fairnie… Those mad years must feel like a lifetime ago. You’ve certainly made an about-turn since, and judging by your recent output are just where you should be in geographical and artistic terms. But do you miss that crazy period when it felt like it could have gone massive? What would it have taken either on your part or that of your record label/producer? Siren/Virgin spent half a million pounds recording the wrong album. By ‘wrong’ I mean that they misread who we were and sold that wrong idea to an influential and powerful record producer. At the time it was all a bit disappointing of course, because you inevitably get very excited about all the possibilities, but looking back, it really wasn’t a very good album. In fact none of us can listen to the production now – it’s a poor effort really. As part of the same process they chose the songs that were probably the least inspired of the loads we had at the time – they don’t really stand up too well now either.